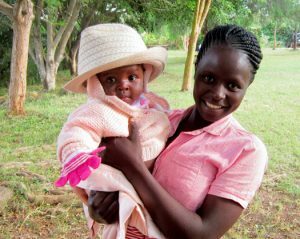 Missionaries Brad and Camie Matlack tell the story of meeting Lydia in Kenya. Lydia’s father passed away when she was young. At 16, when she was part way through her high school, her mother became ill and she had to drop out of school for lack of fees. At this point, a man took advantage of her desperate desire to finish high school. He told her that if she ran away from home with him, he would take her to Nairobi where he would put her in school. We met her at the age of 17, after she had escaped with the help of her neighbors, when the man tried to kill both her and her now 2 week old baby. He had never put her into school. He was a drunk, whose motive had just been to lure her into being his “mistress” in a Nairobi slum. We have walked with Lydia and her baby Blessed for almost a year now. Lydia in front of her new school building… She looks so young and tiny – my reminder to pray for her in this new world, out of the slum. Lydia has been working 12 hours every day, 6 days each week – earning a little less than 3 dollars – just enough for food and rent. But she has dreams! She shared with us in December that she would really love to work in a salon. 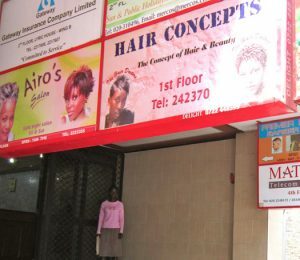 Today we registered Lydia at a beauty school in Nairobi. Sometimes, when it feels like there is no hope, God brings a light… a new beginning! It was such a JOY to me to watch this “LIGHT” register on Lydia’s face! No one is left out in Jeremiah’s words of promise. “…I’ll show up and take care of you as I promised… I have it all planned out – plans to take care of you, not abandon you, plans to give you the future you hope for.” Jer 29:11 Not even a teen-aged girl, trafficked from her home, abandoned with her baby. GOD’S promise even rings true for her!